#AUCA_Open_Lectures. High art of manuscript design. 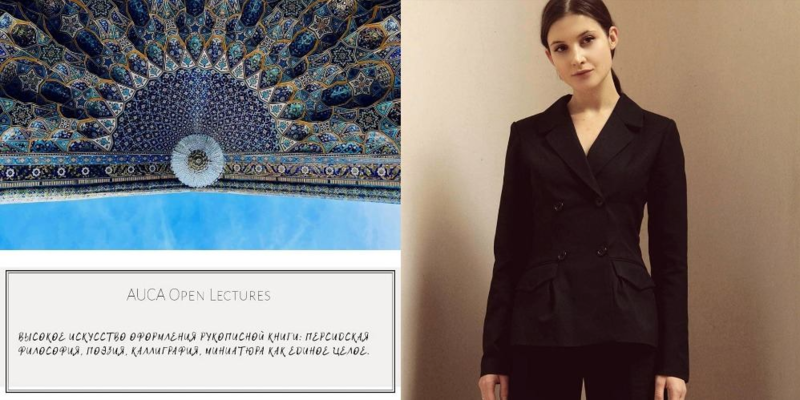 On coming Saturday, February 6, AUCA will host an open lecture on "High art of manuscript design: Persian philosophy, poetry, calligraphy, miniature as a whole". Lecturer: A graduate from the Moscow State University, Kyrgyz artist, Christina Glazunova. Besides the fact that she is a theorist of art, Christina is also a practitioner. Ms. Glazunova illustrated several books, including "The grammar of witchcraft" by the famous British poet, playwright, member of the Royal Society of Arts, David Perry. Christina's artworks participated in a variety of exhibitions, both local and international. Some of her paintings exhibited at AUCA. There is still one of them on the 4th floor. The art of ancient Persia is what the artist studies extensively. The basis for Christina’s master and postgraduate works was the theme of Persian art. Christina studies the rare sources on this topic at the moment working at the French Institute for Studies in Central Asia (IFEAC).